The Uno electric scooter is a unique beast: an electric scooter that looks like a mini-motorcycle and folds up into a Segway-like scooter balanced on two wheels. he company plans to begin producing these electric scooters in limited quantities in about a year with mass production planned after that, according to Harkavy. It will be priced similarly to how high-end Vespa scooters are, which cost between $4,000 and $7,000, he said. The Uno III is styled like a high-performance racing motorcycle but it's much better suited for getting around town than around the race track. Its top speed is limited by scooter regulations at about 35 miles per hour and its range is 30 miles. But the Uno has some unusual features that its designers hope will add to its cachet and utility. Most dramatically, it works in two modes. In its "motorcycle" driving mode, it operates like a typical electric scooter. Its self-balancing mode, enabled by a gyroscopic control system, is when the front wheel pulls back off the floor and tucks itself in between two rear wheels. That unicycle-like mode gives it a three-foot turning radius and makes the scooter nimble enough to move in tight spaces. The owner could, for example, bring the Uno into an elevator and store it inside or operate in city centers where there are a lot of pedestrians, said Harkavy. A driver can shift from self-balancing to driving mode while the scooter is moving. The two rear wheels have their own suspension and electric motors, giving the driver better driving control when in motorcycle mode, according to the company. In the car-heavy culture of the U.S., scooters and electric bikes appeal to a small niche of drivers. But in other parts of the world, two-wheelers are far more common, making them good candidates for electrification. By some estimates, there are already 120 million electric bikes in China, a vehicle segment that has grown rapidly in the past decade. BPG Motors was founded by Benjamin Gulak who, when in high school, decided to start building a cleaner electric scooter after a trip to China, where dirty two-stroke scooters are common. It became a high school science project and then a company in 2008. It was funded in 2009 by private investors. Its scooter is less polluting than a gasoline-powered scooter because it's electric, but the designers are clearly trying to make it cool as well. 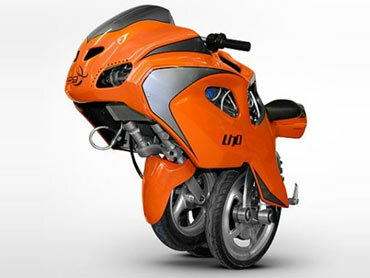 The Uno III is actually the third vehicle produced by BPG Motors in the space of about 18 months. Previous designs, which brought a good deal of media interest, had the self-balancing mode but did not fold out as fully as the Uno III or have the same styling. In the last few years, a handful of companies have formed to develop electric motorcycles and scooters, but these products are still trying to get a real foothold in the U.S. Harkavy expects to find initial interest for its scooter with trend-setters in the U.S., such as celebrities, but a more receptive audience in Europe. "We're definitely focused on the urban scooter buyer but someone looking for more unique vehicles and something quite stylish," he said.